2013 Walk for Truth: Asbestos Kills Event - AREA Fund hosts an annual charity walk each June in Powell River, BC to to raise funds for asbestos-related projects, and to raise awareness of the devastating effects of asbestos use. The second annual Walk for Truth is over and it was a success! Over 130 people participated in AREA Fund’s second annual “Walk for Truth” event - 30 were out of town guests. We sincerely appreciate the effort that people made to attend the event, the community support, and of course the support from all of our sponsors, donors, and volunteers. The Powell River Peak, SunFM, TV That Works and WorkSafeBC all covered the event. Dr. Chris Lee, from the BC Caner Agency, presented cases of malignancies related to asbestos exposure. He highlighted the epidemiology of these asbestos-related diseases, as well as diagnostic and management issues. 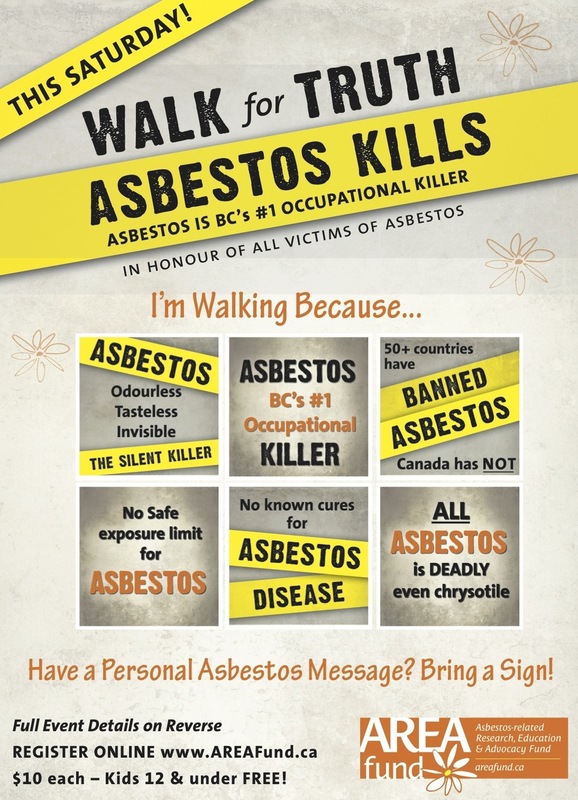 Dr. Tim Takaro, from the Occupational Medicine Clinic at VGH, presented a case of a construction worker with asbestos-related disease detected by screening. This case illustrated the benefits and limitations of surveillance. Rock Reject, an award winning Canadian novel set in a BC asbestos mining town in the 1970s, is about accepting responsibility for one’s actions, corporate irresponsibility and the blind pursuit of profit at the expense of physical and environmental health. Rock Reject won the Beacon Award for social justice literature. Author Jim Williams traveled from Halifax to Powell River, with his family, to participate in the Walk and to share his novel through a book reading/signing at River City Coffee. "Walk for Truth - Powell River"
The mayor, who lost an uncle to mesothelioma, said that he would work with the local unions to pull together more grassroots support for AREA Fund and for the walk next year.